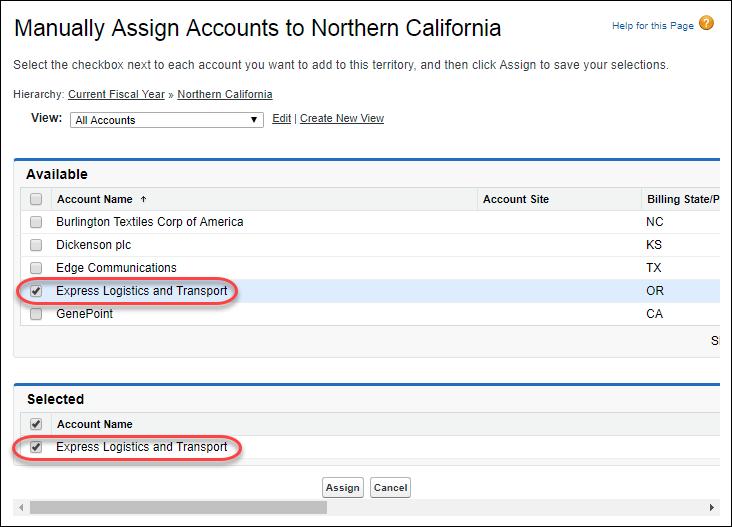 Assign accounts to territories manually and by running assignment rules. Explain how to view account assignments. Explain how to assign rules to territories directly in territory records. Explain how to assign users to territories and see who’s assigned. Activate a territory model, and explain how to archive and delete one. Explain how to report on territories. 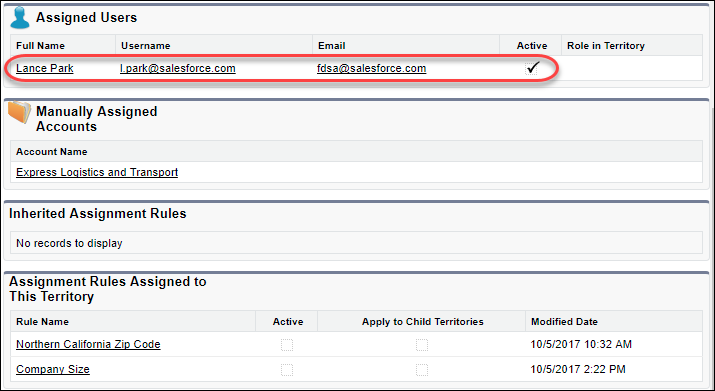 You can assign accounts to the territories they belong to manually or by applying assignment rules. A rule identifies one or more characteristics you use to define that territory, and tells Enterprise Territory Management to assign accounts with those characteristics to that territory. If your territory is in Planning state, running rules lets you preview account assignments. If your territory is in Active state when you run rules, accounts are assigned to territories according to your rules. Rules can work together within territories and child territories. For example, you create a territory called Western US States, with child territories Washington, Oregon, and California. From the Western US States territory record, you create a rule that assigns accounts in Washington, Oregon, and California to that territory. You apply that rule to child territories and then, from the California territory record, you create a rule that assigns accounts in California to the California territory. For any child territories for the California territory, you don’t need to specify the state in the criteria if you mark the California territory rule as inheritable to child territories. Instead, you can use more specific criteria, such as ZIP code or industry to create child territories for California. Now that Maria’s got a Northern California territory set up, she needs to assign accounts to it. She follows these steps to create and run an assignment rule that speeds up the process for her. From the Territory Models page in Setup, open the Current Fiscal Year territory model by clicking View Hierarchy, and then open the Northern California territory. In the Assignment Rules Assigned to This Territory related list, click New. On the rule edit page, for the rule’s name, enter Northern California Zip Code. For the selection criteria, enter Account: Billing Zip/Postal Code, greater or equal, and 94000. For the next row of selection criteria, enter Account: Billing State/Province, equals, and CA. In the Assignment Rules Assigned to This Territory related list, click Run Rules. Maria sees a message stating that the rule is running. She gets an email when the process is complete. For now, the territory model isn’t activated, so running rules is just a test. That gives Maria a chance to make changes, if needed, before activating the model. Maria wants to practice assigning an account to a territory manually and then preview her territory assignments. Manual assignment is useful for accounts that have unique characteristics and therefore can’t be assigned by rules. For example, Ursa Major’s Express Logistics and Transport account is based in Oregon but is considered part of the Northern California territory for reporting purposes. Open the Northern California territory. In the Manually Assigned Accounts related list, click Add Accounts. In the Available related list, select Express Logistics and Transport. On the Northern California page, click View Accounts to verify that the account was assigned. Next Maria applies an assignment rule to a territory. 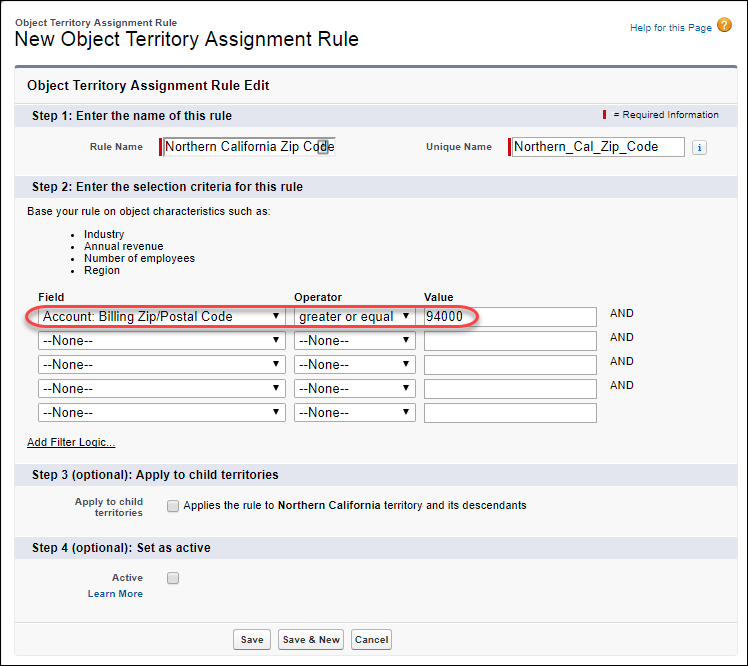 You can apply assignment rules to a territory directly from the territory record. Maria has spent some time setting up several more assignment rules, and she wants to add the Company Size rule to the Northern California territory. If you’re following along in your Trailhead Playground, you won’t see the rules that Maria sets up, but in your own org, you can create the rules you need. On the Northern California territory page, in the Assignment Rules Assigned to This Territory related list, click Assign Rules. In the Available related list, select Company Size. Next Maria assigns a user to a territory. You can assign users to the territories they operate in to sell products and services. For example, Maria wants to add Lance Park to the Northern California territory, his favorite. Here are the steps she takes. If you’re following along in your Trailhead Playground, you won’t see Lance listed as a user, but in your own org you’d see your company’s Salesforce users. 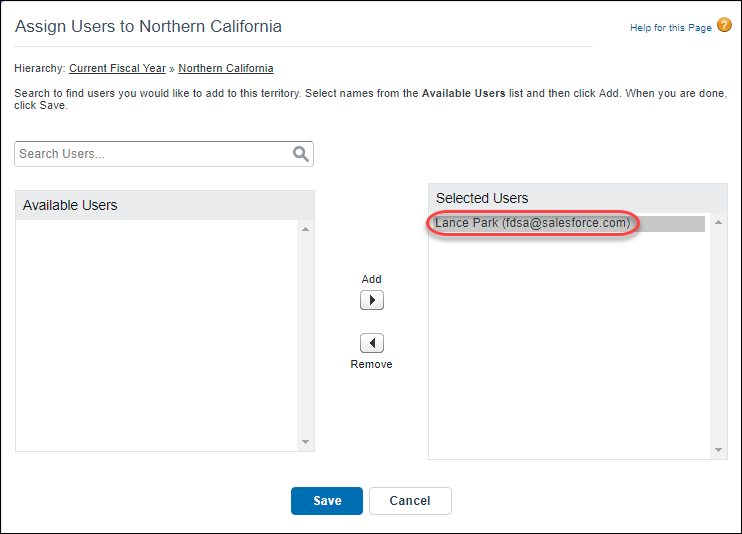 On the Northern California territory page, in the Assigned Users related list, click Manage Users. In the Available Users list, select Lance Park and click Add. Lance is now assigned to the Northern California territory. He’ll be happy when he finds out! When you’re satisfied with the structure of your territory model and its territory account assignments, you’re ready to activate it. You can also maintain models in Planning and Archived states for further modeling and reference. Only one model can be in the Active state at one time, and you can activate a model only if it’s in the Planning state. After activating a model, you can’t reset it to Planning state. You can set it only to Archived. And after you archive a territory, you can’t reactivate it, so make sure you plan carefully! Maria’s been working hard, and she’s thoroughly tested her territory model, so she activates it now. Here’s what she does. Open the record for the Current Fiscal Year territory model. Click Activate, then click Activate again to accept the prompt. The model state changes to Activating while Salesforce processes Maria’s request. Maria sees a message stating that activation can take some time, depending on the size and complexity of the model. When the process is complete, we notify Maria by email. Then she can run assignment rules for the territories in her Current Fiscal Year territory model whenever she needs to. Later on, if Maria doesn’t need to use a territory model anymore, she can archive or delete it. Archive a territory model when you don’t actively use it but you want to keep it around as a reference. Delete a territory model only if you’re sure you won’t ever need to reference it in the future. Accounts and users are assigned to territories independently, but when an account is assigned to a territory, that territory’s users have access to the account. It’s easy to find out who those assigned users and territories are by looking at an account record. Maria wants to check the Express Logistics and Transport account now to see who’s assigned as users and which territory is assigned. But before she or the rest of the Ursa Major team can do that, Maria needs to add two related lists to the account page layout. Otherwise her team won’t be able to see this helpful information. Here’s what she does. In Setup, click Object Manager and then Account. Click Page Layouts and then Account Layout. In the upper pane, click Related Lists. Drag Users in Assigned Territories and then Assigned Territories to the lower pane. Click Save and then Yes. Now let’s check the account to see what shows up. From the App Launcher, select Accounts. Maria sees the Northern California territory assigned to the Express Logistics and Transport account. She also sees Lance Park listed in the Users in Assigned Territories related list. Looks like all her hard work has paid off! Maria can also find out which territories an assignment rule applies to, in case she needs a reminder. Here’s how she checks the rules that apply to the Current Fiscal Year territory model. Open the Current Fiscal Year territory model. Maria sees Company Size and Northern California Zip Code listed as rules that apply to the Current Fiscal Year territory model. You can run reports to get useful information such as accounts assigned to territories, users assigned to territories, and summarizable account fields by territory. 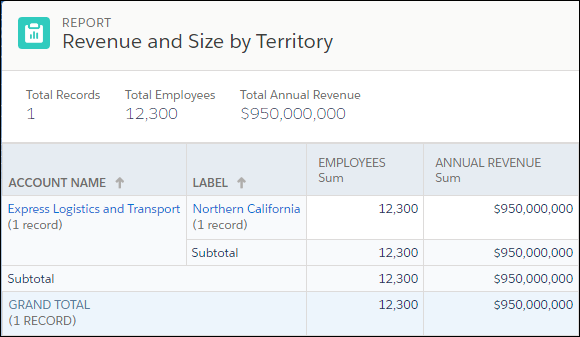 Reporting on summarizable account fields is especially helpful, because it lets you gauge territory size by reporting on account data such as annual revenue or number of employees. First you need a custom Territory Management report type that relates the objects you want to report on. Then you create reports that belong to that type. We won’t take the time to show you how Maria creates hers, but we’ve provided links to instructions for creating report types and reports in the Resources section. Here are suggestions for other reports you’ll find helpful when managing territories at your company. Maria’s completed the basic steps for getting Enterprise Territory Management up and running. Now it’s your turn to try out some of the tasks you’ve just learned about.